Do you talk to your audience or talk down to them? What does your eLearning courses read like? Like a text book that makes your audience doze off or an interesting story that they can't wait to read through? Do you come across as friendly, knowledgeable, and convincing in your courses or is there something about the way you talk that puts your audience off? The tone you adopt for an eLearning course isn't about what you say but HOW you say it and the effect it has on your learners. Learners may not see their instructors face-to-face but that doesn’t mean they won’t notice your approach. On the contrary, words have to work harder than ever if you don't want to lose your learners. In eLearning, text and audio are the only way to show emotions, personality, and training intentions. Besides, man is a social animal, and he likes to talk to other human beings. An advertisement from a "brand" or a list of instructions from a "business" is not as convincing as an endorsement from a friend or advice from someone trusted. The courses you create should read or sound like the kind and wise words from some such friendly and knowledgeable person who wants to help the audience. You should write in a human tone. Corporate learners are seen as staid and serious people who cringe at all things casual. So they have to be dished out screens after screens of bullet text. In fact, in many eLearning circles, the notion is that the duller the course, the more "professional" it is. The poor learners are made to go through lifeless courses that do not inspire them. The result: in an attempt to create "professional" corporate courses, you end up with content that does not motivate and fails in its objectives. Learners cannot be wooed with glitzy effects. Nor does technology impress them as much. The secret sauce is the tone. The right tone for a corporate eLearning course is a happy blend of the informal and the informative, the casual and the convincing, and the entertaining and the enlightening. Corporate learners are just like other people; they too watch movies, browse funny cat videos, and love to have a good time. The tone in your eLearning course must be the one they will love to read. The tone should convince the learners there is value in taking the course. It should let the learners engage with the course. It should trigger positive emotions in the learners. 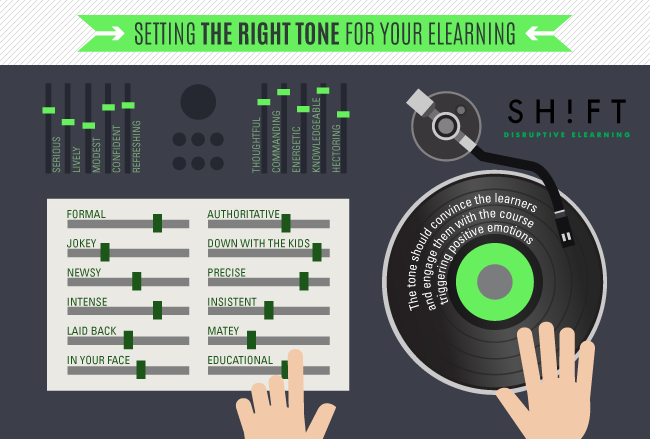 Getting your tone right is key to making the biggest possible impact with your eLearning courses. But, before you choose and set the tone, ensure that you know how different types of content and target audience demographics and expectations influence the choice of a tone or writing style. Audience Demographics: You address your teachers differently than you talk to your siblings. You use a different language when delivering a presentation than when you hang out with friends. Your audience determines the kind of tone you use. It is no different in eLearning; use a tone that your audience is familiar with and can relate to. Nature of Content: If your eLearning course aims to bring about a change in the behavior of the audience, you have to pepper your textual content with a lot of energy and write in a motivational tone. If your course aims to teach the audience how to use a software system, you should use a matter-of-fact and straightforward writing style. 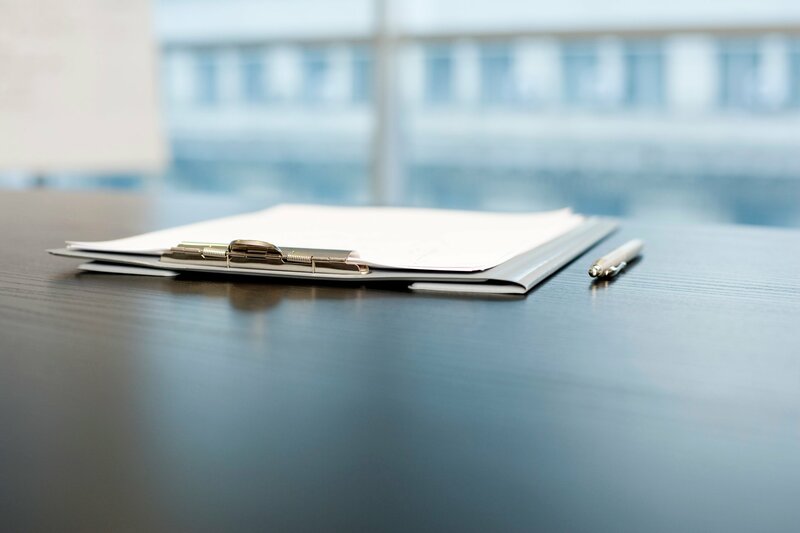 Brand Image: Your client wants to project his brand identity in the course he commissions. So you have to use a tone that aligns with his brand's image—fun, quirky, serious, or authoritative. Do you want to persuade your audience to build certain habits or ditch a few others? Then you have to adopt a conversational style of writing and sound like a friend to be able to motivate them to change their attitudes. Do you want to come across as an authority in your subject matter, so your audience is compelled to pay heed to your advice? Then you have to forego the casual, informal tone and use more forceful (but respectful) language. The tone you write for an eLearning course also depends on how YOU want to communicate with your audience. If you believe gentle humor will get the message across more effortlessly, then so be it. If you want to just dump the facts on an audience who are taking a refresher course, then you can adopt a cut-and-dried tone. Create a tone-of-voice template to help you ponder on the style you will adopt. Write it down. Use plenty of adjectives. Include lots of examples of what your tone is and isn’t. Check our next blogpost to find out what you can put down in the handbook. 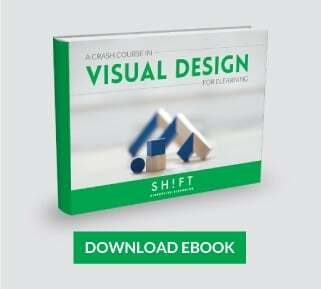 An instructional designer is not just someone who writes well. He is a sensitive person who can get into the shoes of the learners and delve into their minds to figure out how they can be motivated, assured, comforted, or convinced. He finds the right tone so he can turn a course from simple blah-blah to something with a lot more energy. How does your course sound? Tell us in the comments below! WANTED: Creative Instructional Designers. Are You One?